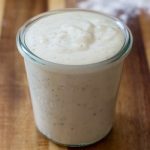 Earth Day is next Monday so I thought it’d be fun to whip up a kid friendly Earth Day inspired treat! I’m not really a fan of mud or dirt, especially when it gets all gunked up under your nails. I suppose that’s what gloves are for but they’re not as easy to work with. That’s probably the main reason why I don’t have a garden, the mess factor. Not to mention that the concept of remembering to water plants is a hard one for me. I can keep my kids and cats alive but plants is whole other story. I even went ahead and started a new batch of green onions recently and totally forgot to add water, thus killing them after but a few days. Oops. Did you know that you can regrow green onions? Try it, it really works… assuming you remember to feed it water. Apparently you can do this with all kinds of veggies. I’d be interested to see how it works with others, maybe that’ll be my summer project. But someone please remind me to water them. 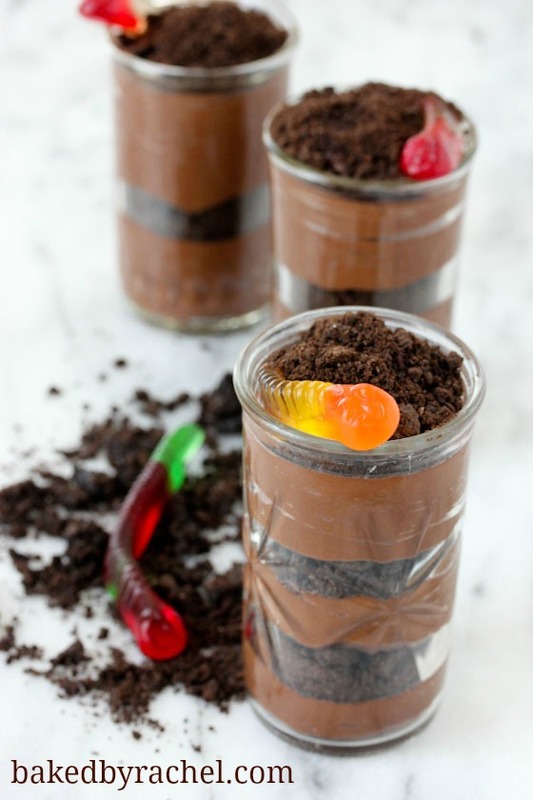 Chocolate mud on the other hand is way more my style, with cookie dirt and a smiling gummy worm. They’re happy they get to slither around in chocolate for a change. ;) Seriously, I had no idea I was buying gummy worms with faces. It’s kind of hilarious and creepy at the same time. I mean I’m not a fan of worms but ones that stare at you? Is that how vegans feel about animals… especially a full fish on a platter? That kind of grosses me out too, don’t worry. I don’t want my meal staring at me. Not only are these perfect for Earth Day, but really they’re perfect for any day. 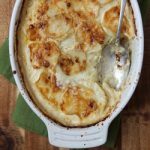 They’re fun and totally easy to whip up. You could cheat if you really want to but homemade pudding means you can control what’s in it and it’s so much tastier too. Plus, it’s just nice knowing you can make something from scratch! No boxes required here. My entire family loved these. 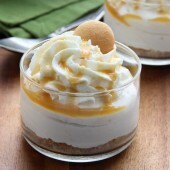 They’re flavorful, smooth and creamy with just the right amount of pudding to cookie crumb ratio. I love the added texture the cookie crumbs gives to a very simple dish. Of course the worm is a must, especially if you’re serving this to kids. My biggest issue with candy is that it’s so hard to find candy from a peanut safe brand and facility, especially when looking for something super specific like gummy worms. If you happen to be searching for nut safe gummy worms, these are Target brand. Remember to double check the package in case anything has changed in their processing. 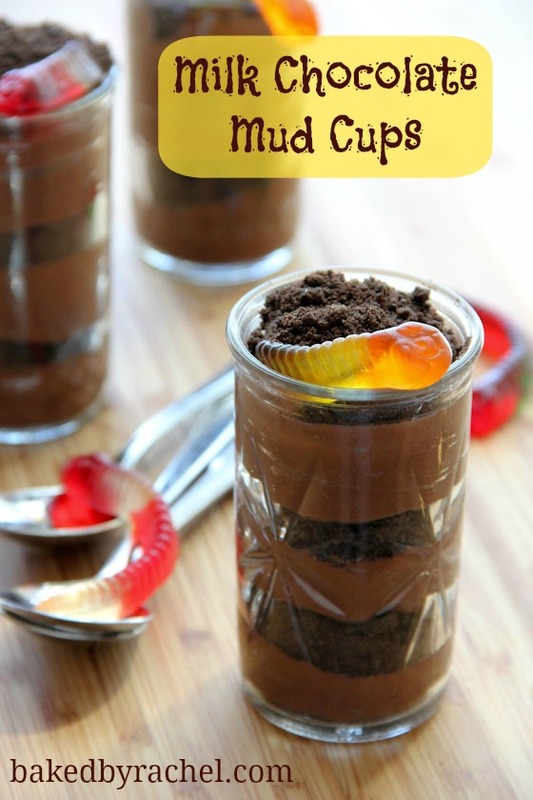 After you’re done cleaning up, celebrating the earth or planting a new tree be sure to whip up these mud cups for a tasty treat! 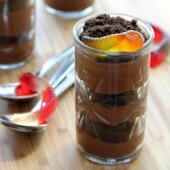 Layers of milk chocolate pudding, crushed chocolate cookies and a gummy worm. A perfect Earth Day treat! In a medium bowl, mix cocoa, sugar and salt. Set aside. 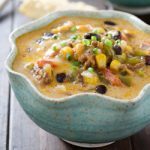 In a separate medium bowl combine cornstarch and heavy cream. In a double boiler over simmering water, heat milk until steaming. Remove from heat, pour half of the milk into the cream mixture, while whisking. Add cocoa mixture to the liquid. Return cocoa mixture to double boiler, place over simmering water. Cook, stirring for approximately 5 minutes or until thickened. Remove from heat. Add chocolate chips and vanilla, stirring until smooth. Transfer to a clean bowl. Divide among bowls to serve immediately or cover with plastic wrap pressed to the surface, to avoid a pudding skin forming, chill until ready to serve. Layer pudding and crushed cookies as desired. Top off with a gummy worm for decoration. Enjoy! 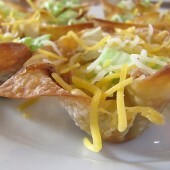 I used 1- 10oz bag of Hershey's mini Kisses for this recipe. These are so cute and perfect for Earth day! Ah, I haven’t made worms ‘n’ dirt forever. A few years ago, I threw a fancy dinner party for friends, then served these babies in wine glasses. What a hit! I like that you included the recipe for from-scratch pudding. I’m going to have to do it that way next time around to make them extra special. Fun! That’s too funny! I imagine your guests were shocked but delighted by the special treat. These are perfect for Earth Day and I bet they are super yummy as well. I’m gonna make these for my nephews, they would love em! I hope you do! They’ll love them. I’ve been wanting to make something like this forever! I think they’re so cute! 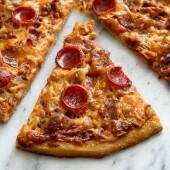 You have no idea how much I want one of these right now! 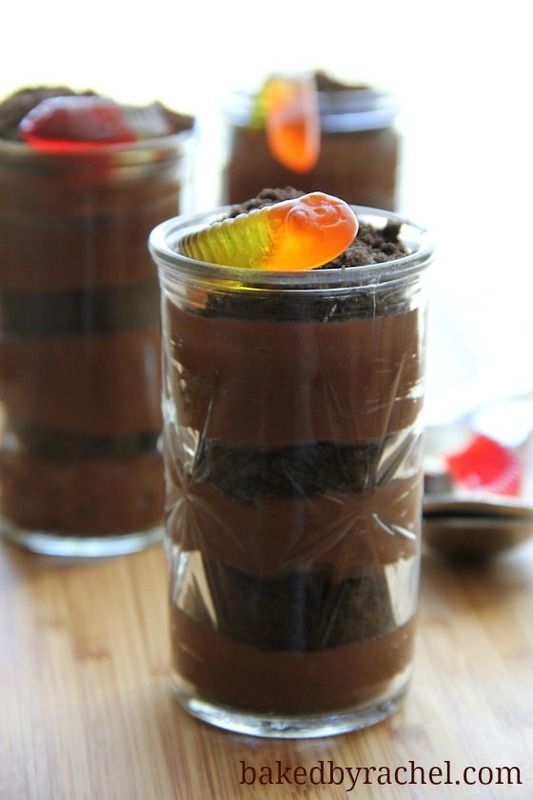 I used to love “worms and dirt” growing up + it still looks delicious to me. So fun! Haha! 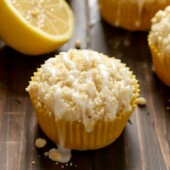 Love these little Earth day inspired treats! They SO take me back! I have fond memories of having these at a church gathering as a child. Haven’t had one since and I really want one now!! Too cute! My niece and nephews would love this! Perfect for earth day! I remember having these in second grade at a class Halloween party! Good memories! 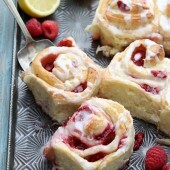 I am so making the this weekend! These are adorable! A great treat to celebrate Earth Day! 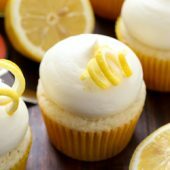 This is THE perfect Earth Day treat! I used to LOVE these. I remember making them in pre-school, and making a huge mess. Yours look much better than mine did, of course! What a great Earth Day treat! Oh my word, the faces on the worms! I don’t think I’ve ever seen those. They’re cute :) Shane loves dirt, he’d be all over this! When did gummy worms start having faces on them?!?! Ka-reepy!! I haven’t had a good mud cup in AGES. Clearly that needs to change. haha! I know, it’s kind of weird. Happy Earth Day! I haven’t had dirt cups in so long. They were always one of my favorites. I will have to try these. Haha I know what you mean. I always seem to kill my herbs too. I tried growing garlic too in a cup… turns out it just smells up the house. 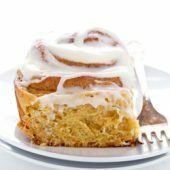 Take it from me, and dont do it =/ But I do need to go make some of these babies! They are so cute! Minus the creepy worm faces! I need homemade pudding in my life! I love these mud cups!! soo cute!plus pudding is always a fav! I made this years ago before we had any children in our house as gift for dinner with friends, I put it into a foil lined clay pot with artificial flowers and when it was time for dessert I handed out miniature gardening tools to use to eat the dirt. Our friends eight year old daughter and 14 year old son screamed in horror until they discovered what it truly was. I will have to do this again now that we have a six year old in our house. Thank you for the laugh this morning. I pictured the children screaming in horror over what everyone was doing. Too funny. What a brilliant idea!! I love it! !